It's that time of the year again - arrival of Spring and we start thinking about Spring cleaning - getting rid of clutter, re-organising, cleaning and tidying things up. Once you are done with Spring cleaning, it feels so great. I feel Spring cleaning is not just about getting your home and surroundings in order and organised but also a way to feel happy and reduce stress as cleaning is very therapeutic. Spring cleaning is on at our place. I gave the fridge a good scrub over the weekend - cleaned all the shelves, the interior walls and the rubber gaskets on the door. Looks much better and tidier now. The oven is next. Mr.H has been handling the bathroom. The bathtub, the faucets and the shower head all look clean and like new. Mr.H is much more organised than me and he actually made a list of things he needs to get done in the bathroom during the Spring clean. He has cleaned the tiles, the vents and even the light fixtures. Assisting in our Spring clean were products from Astonish. All the products we used were good but special mention goes to the Grout & Tile Restorer and the Oven & Cookware Cleaner. The Grout & Tile Restorer is a foamy formula and very effectively removed dirt and grime even from vertical surfaces. The Oven & Cookware cleaning paste is excellent. With minimal effort I was able to clean the kitchen sink to look like new. A big thumbs up from us. Also worth mentioning is the fact that Astonish believe that cleaning products don’t need to be tested on animals or contain any animal derived ingredients to deliver results. They are approved by cruelty free international and the Vegetarian society as well as being Vegan society registered! 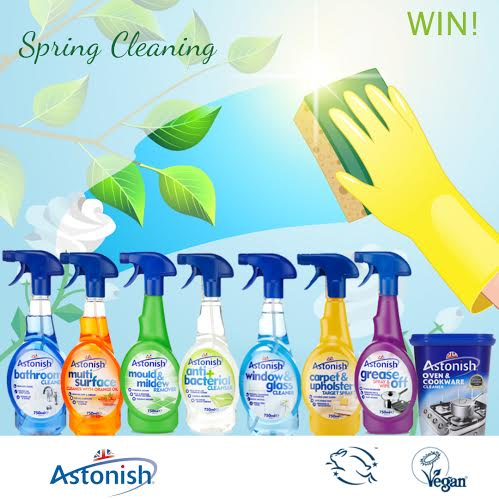 Want to win a Spring clean hamper from Astonish? Entry is simple. Use the Gleam widget below to enter. The more options you complete, more your chance of winning this astonishing cleaning bundle. All the best! Take up any rugs you have, hang them over the washine line and beat them with a brush! You will be amazed (or shocked) at how much dust comes out! I always do this in the Spring! Place a large microwave safe bowl with 1 cup of water and a chopped up lemon, lime or orange or even several tablespoons of vinegar inside. Turn the microwave on High for several minutes or until the solution boils & the window is steamy, then let it sit to cool for 15 minutes before opening the door. Remove and wipe out the inside & outside with a sponge. Mine is tackle one room at a time and get the whole family to join in. I do one big spring clean once a month.Thern just keepon top of it as its needed. white vinegar & newspaper does wonders for mirrors & windows. Half a lemon makes a wonderful air freshener. Save old toothbrushes for cleaning in nooks and crannies. Clean the windows first - then you can see properly just how grubby everything else looks! A little dishwasher rinse aid added to water makes windows sparkle, and stay smear free. I make a paste with some baking soda, some white vinegar and few drops of lemon juice. It will remove the stains and the odours from anywhere including the bottom of the oven ! Be ruthless with getting rid of 'stuff' makes keeping surfaces clean so much easier and do the bedroom first - motivates you the next morning! Keep the children far away from the house - is my number one spring cleaning tip for keeping a clean home clean! Other than that, get someone to service your Dyson or vacuum cleaner to make sure it's picking up properly. Invite guests round to stay, that always makes me put extra effort into cleaning! Be ruthless - if you declutter first, it'll be that much easier to clean! Get everyone to muck in, the more hands the quicker its done. My best tip is little and often, there's nothing worse than not knowing where to start! Spring Cleaning tips? Not sure I have any but for me little and often, cleaning the fridge before I go shopping, vinegar and newspaper for windows and mirrors, cleaning the washing machine once a month with a hot cycle. Thank you all for the wonderful cleaning tips. Please keep them coming. We have hard floors in our downstairs rooms as we have two giant breed dogs who create there own problems with drool etc. My advice is purchase a floor steamer they are relatively cheap, you can even clean carpets,windows,ovens etc. We spray floor cleaner on the floors and then steam that particular floor, don't forget to change your floor cloths regularly as they can only absorbe so much. magic sponges are marvellous! give them a go they are amazing! I now only use microfibre cloths to clean windows and mirrors..anything glass..clean with just warm water and buff to shine with dry tea towel..no smears! Focus one room at a time. Don't attempt any cleaning until you have de-cluttered and sorted every cupboard, shelf and surface first.Then wash curtains and soft furnishings ready to go back after you have washed everything down. Baking soda and vinegar will unclog any drain. Always have plenty of white vinegar on hand. bicarbonate of soda and white vinegar to clean a dirty oven! Do little and often, rather than trying to do the whole lot at once. Cat and Rabbit urine is one of the toughest things to clean up, especially from cream carpets. Put down white vinegar and remove with soapy water! Give the kids the feather duster - they'll love dusting around while you can get on with other chores! use a carpet cleaner on a warm day, then have the doors open to help the dying process! Attach a clean cloth to a broom to clean and dust ceilings around the house. for the hot weather i only use a carpet sweeper - so much easier than lugging the vac round and its easy to keep on top of cleaning! Do a little bit often - why not clean during the ad breaks on TV - amazing how much you can get done in time that would otherwise be wasted and if you keep on top there is no need for big spring clean! When using products to clean, always leave them on the surface a little while to do their magic and eat away and the grease, dirt and grime and use microfibre cloths to wipe the grunge away...never just squirt and wipe. Don't be scared to throw things away! If you haven't used it in the past year, out it goes! Throw away / donate old unwanted items - declutter as you go along! Clean windows on a cloudy day, this will mean that as you clean the clener will not dry to fast. When you see something needs cleaning then do it right away then it will never become a huge job. Clean fridge insied: use warm water and put some vinegar. Leave your fridge super clean, removes bad smell. Do a little bit each day - much easier than a huge clean once a week - far too daunting! Have lots of cloths and wash them when used. Completely declutter first, get rid of old correspondence, anything you haven't used in a while, old clothes, everything! Do one room at a time, and don't let it get out of hand the rest of the year. Get someone who doesn't mind spiders to move your furniture away from the walls so you can clean behind! Declutter first and take your time. Don't do it all at once as it's daunting. If it hasn't been used in 6 months - throw it, you obviously don't need it. Make sure you have plenty of storage so things look neat and tidy. Keep a bag of all old t-shirts, they come in great for cleaning. No spring clean for us - my wife does it every day! Steam cleaners are fantastic for intensive cleaning. Plus they are so easy to use. I wash my leather sofa with soapy water and put on saddle soap. I give all the blinds a wipe, and wash my curtains. I always go through my wardrobe and declutter items not worn in the last 6 months and take to the charity shop. Keep on top of everything, then virtually all that will be needed is to clean the carpets. Wait for a warm dry day when you can keep doors and windows open for speedy drying. Use sprays, sooooo much quicker! Clean from top to bottom, literally! Start with ceilings/cornices and light shades upstairs and work your way down to the carpets and skirtings. Then do the same downstairs. Now this would be useful right now - a house move & half term imminent!! Get the kids involved and make it into some sort of game or challenge to keep things fun. just keep on top of it, if you fall behind its harder to do. Place lots of small plastic rectangular containers in kitchen drawers, then you can separate all the small items we throw in there, and make items easier to find. Start from the top of the house down and be brutal and declutter as you go, space makes a house cleaner. Play your favourite music to bop along to while you work! Write out every little thing you have to do first. I always find it motivating as I'm ticking off all the tasks completed. Start in the smallest room so you feel like you've achieved something which will encourage you to carry on! Give your shower doors a good clean, then wipe on a coat of glass protectant. A good coat of this should protect your glass for around 6 months, depending on how many times the shower is used. Purchase a squeegee and use it to wipe off the water from the door after each shower. If you do this, you will never get soap scum or limescale from water droplets building up on your shower door again, and the only thing you need to do is add on a new coat of protectant every 6 months. Be organised, theres lots to do! Tackle one room at a time and set aside time for each part. Don't ever try to do a proper clean when hubbie decides to help! It will not end well! Baking soda and white vinegar mixed with water is marvelous for cleaning tiles. I doubt I have any decent tips, I just try to do cleaning when I can!